The Oscar-winning team of Ron Howard and Brian Grazer present a riveting, spine-tingling thriller destined to become a classic! Academy Award-nominee Cate Blanchett is Maggie, a young plains-woman raising her daughters in the desolate wilderness of New Mexico. When daughter Lily ... read full description below. The Oscar-winning team of Ron Howard and Brian Grazer present a riveting, spine-tingling thriller destined to become a classic! Academy Award-nominee Cate Blanchett is Maggie, a young plains-woman raising her daughters in the desolate wilderness of New Mexico. 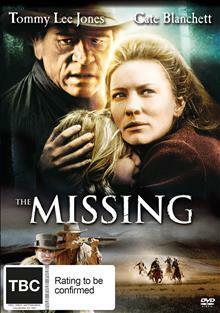 When daughter Lily is snatched by a dark-hooded phantom with shape-shifting powers, Maggie's long-estranged father Oscar(r)-winner Tommy Lee Jones appears suddenly, offering help. Though stunned by his return, Maggie knows she must swallow both hurt and pride if she is ever to see Lily again. Unaware of the frightening events that lurk in the distance, father and daughter set out to track down the fiend that took Lily. But lying in wait is horror so unspeakable it will change them forever!